The denim jacket is one of those staple items in your closet you don’t really appreciate until you really need it. To be honest, I got rid of the denim jacket I had because I was over it and didn’t feel I needed it. As the saying goes “you don’t know what you got until its gone” rings true. It wasn’t until I was looking for a perfect jacket to complete a look when I realized I needed a denim jacket. So I purchased this one and I love it. Its the perfect jacket to throw on with anything and go! From jeans, dresses or skirts, the options are endless! I like to roll the sleeves up and stack a few bracelets on for a little extra “umph!” I also loved pairing my black, ripped jeans with the brown, suede over the knee boots and snakeskin bag. Its a great mix of textures and adds a little excitement as well. Do you still rock a denim jacket? How do you style this classic piece? Oh, before I forget! I must invite all of my Dallas fashionistas out to a Pop Up Shop event featuring “Luxury Garage Sale” at the “W Hotel- Victory Park,” Sunday, March 6th! Luxury brands such as Chanel, Celine and more will be on sale at great prices. Time to whip out that credit card and shop! Hey lovelies! I have another color combination for you today. Camel and gray looks so good together don’t you agree? 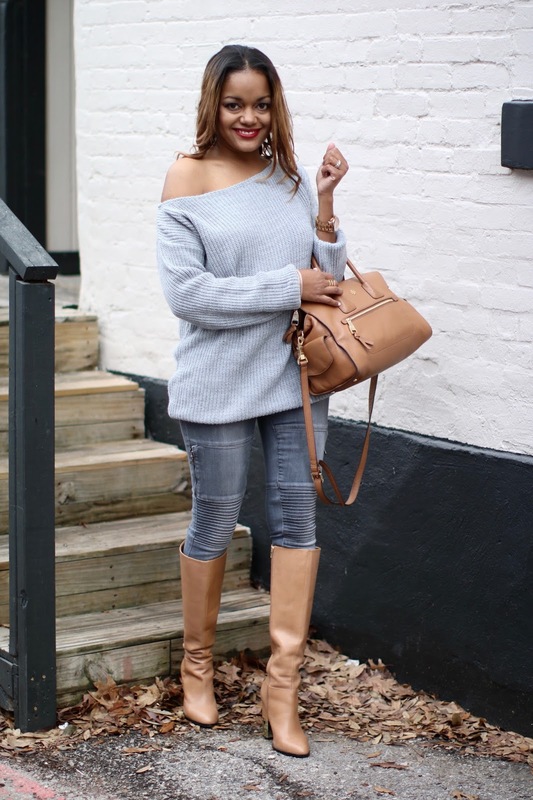 Its nothing like a great pair of camel boots and off the shoulder sweater to build a casual but sophisticated look. You guys see me wear these gray jeans ALL the time. Unfortunately, they are no longer sold. I hate that because they are my absolute favorite pair of jeans. I did link a few similar for you below, I hope that helps. The sweater can also be worn as a dress, but I prefer it as a sweater. It’s surprisingly warm considering we shot this look in 30 degree weather… Brrr!! If you follow me on Instagram, you would know my birthday was on Friday!! I am celebrating 34 years of life on this earth and I am so blessed. Honestly, it feels like the older you get, your birthday becomes “just another day.” But, I don’t take it for granted! As my mom would say, I thank God for life, health and strength! And its so true!! Count your blessings!! Have you worn any of the color combo’s I posted lately? If so, please tag me on Insta or comment below so I can check you out!! I’d love to see it. See you soon!! similar here and here under $50! Wearing white in the winter time is considered a faux pas to some. I use to be one of those people who would never wear white in the winter. I can be old school in some ways, but not anymore when it comes to fashion! I’ve learned through my Pinterest and Instagram addiction that white can easily be worn during the colder months. So I scoped out my closet to see what look I could come up with and I think I did pretty well, don’t you agree? 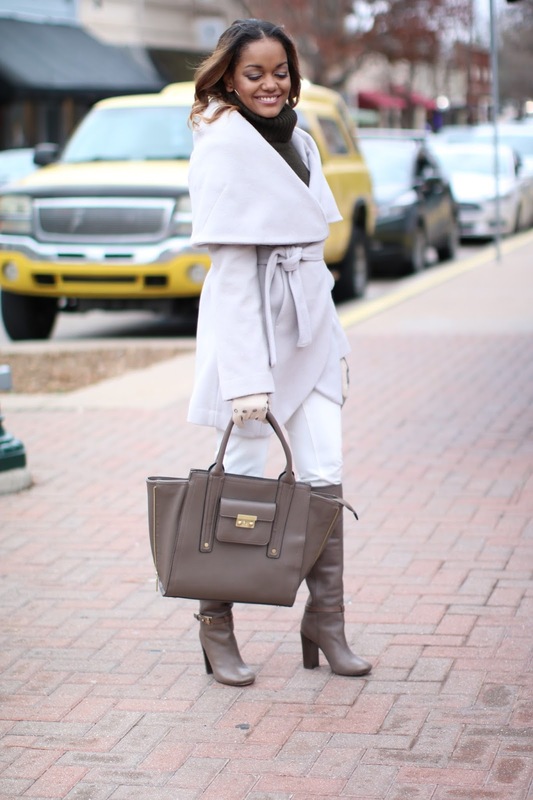 This beautiful coat and taupe accents worked well together with the contrast of the white pants. My gorgeous, leather driving gloves were a Christmas gift from my Mother – in – law. To say she did a fabulous job is an understatement!! She also gifted me this shawl coat a few Christmas’s ago and I love it so much. Olivia Pope anyone? Do you wear white after Labor Day? 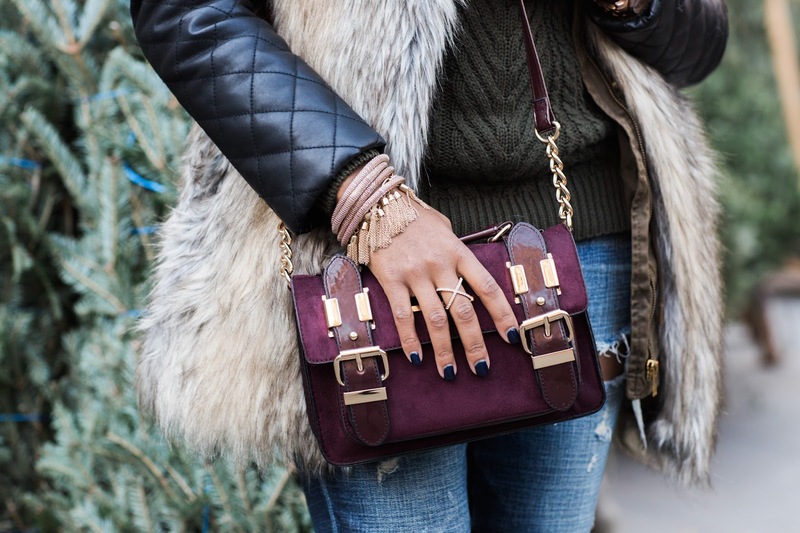 How do you like to wear it in colder months? Chat with you Sunday in my next outfit post!! The Perfect Camel Coat and on a Personal Note…. Happy 2016!!! I am a girl who loves coats! It could be because I grew up in Michigan and every fall, my mom and I would go shopping for new winter coats. I would always get one for school and one for church. Even though I now live in Dallas and our winters are short, I pretty much buy a new coat each year. It’s such a habit and I don’t mind one bit. My mom was tall at 5’9 and I would always envy her ability to wear ankle length coats because they just looked so fabulous on her. She was a fashionista too (Rest in Heaven Mom)! I’m only 5’3-but all legs, however, there aren’t many long coats out there that I can rock without drowning in them. Well, when I spotted this one I knew I had to have it. It’s more of a midi length coat which is perfect for my height. The fact that it has a funnel neck and a gorgeous camel color was icing on the cake! I personally would wear it with heels to give me some height. But, I’ve seen plenty of Pinterest pictures of women wearing coats like this with sneakers and I’m feeling it! When I initially started my blog, I thought, “ok, so you’ll do the blog and that can be an extension of yourself. Something you can do on the side that you’ll enjoy.” Well, scratch that! It means so much more to me than that. My mindset is now “lets go from a blog to a brand! !” I’m ready to get started my friends. Tell me, what are you going to do in 2016 to go to the next level?? Let’s grow together and make it happen!! Handbag- Zara (old) similar here and here under $40!